Copied from DPI-ConnectEd, which is published by the office of State Superintendent Tony Evers and reaches more than 5,000 subscribers with each issue. Lou Kindschi, a social studies teacher at Oregon High School, received the first Global Educator of the Year award. State Superintendent Tony Evers and David Warren of Milton, a past district governor of Rotary International, presented the award during Friday’s general session for the 2016 State Education Convention in Milwaukee. Kindschi was chosen for her efforts to infuse global studies across all of her classes, her work as coordinator for her school’s Global Education Achievement Certificate (part of the statewide program), and her outreach to make global studies a part of every student’s education. Kindschi organized a regional Global Education Summit for administrators, educators, and students and developed aglobal education webpage to provide resources and assistance for other educators to include an international perspective in their classes. She advises the Diversity Club that provides students with opportunities to experience other cultures through a variety of activities, including a global speakers forum, foreign film nights, field trips to international fairs and ethnic dinners, and a new WorldLens project that has students creating films about topics of importance and sharing them with teens from around the world. Kindschi’s extensive personal background in global learning includes a law internship in Bangkok and Fulbright summer study scholarships in Indonesia, India, Thailand, and Germany. 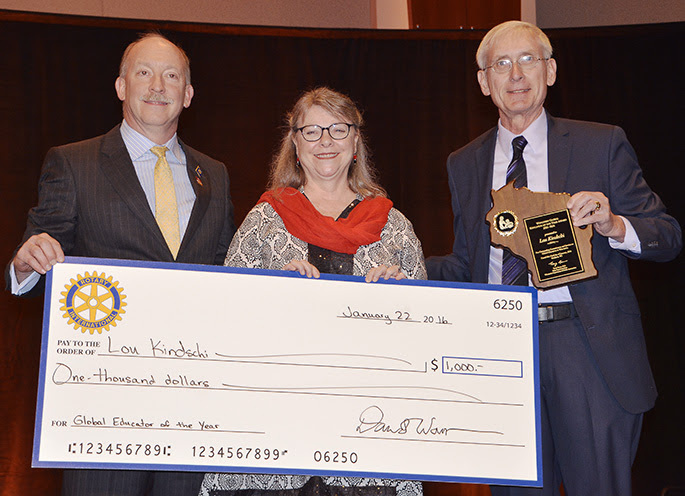 The Global Educator of the Year award is sponsored by theStatewide International Education Council and comes with a $1,000 prize supported by Dane County Rotary Clubs from DeForest, Madison East and West, and Sun Prairie.